It’s not easy to be a woman these days. The vast majority of men, throughout the world, are glued to a screen watching with boundless enthusiasm, while munching on snacks, as an Iranian footballer does his best to knock a Nigerian footballer down to the grass. The easiest thing to do is to simply get upset, to yell something like, “You men and your stupid football!” or escape for a month to friends who moved to Gobi Desert (as if they don’t have television there). On the other hand, you could try to implement the saying, “If you can’t beat them, JOIN them”, and find something in this hysteric event that could also interest a woman like me, who doesn’t know the difference between a penalty and an offside. It’s hard to ignore the fact that the World Cup is a summit meeting between diverse cultures and languages,. You can find pale Dutch fans drinking beer with Algerian fans while a player from Cameroon swaps shirts (ugh, with all that sweat!) at the conclusion of the game with a Brazilian star who, until then, he had only seen on TV. This amazing bonding, between worlds that are so different, reminds me of only one similar event – the Olympic Games, which I was fortunate enough to attend personally, two years ago, in London. This mixture of diverse people and diverse languages simply fascinates me, like some kind of modern-day Tower of Babel. When I began to join the men in my life –Ronnie, my husband and Tom my firstborn son, and watch part of the games (let’s not get carried away, okay? 90 minutes of this stuff could cause me brain damage), I discovered a few things that I would like to share with you: . I suppose that the communication is usually in English, and since most of the players are not exactly Oxford graduates, this communication is very basic and is utilized mostly with very clear and very exaggerated body language. 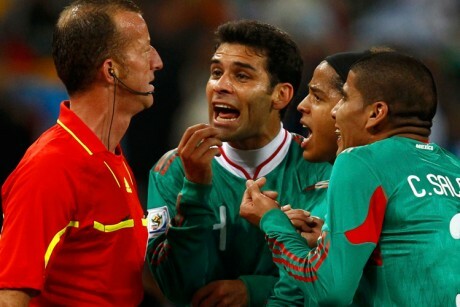 It’s easy to spot a player trying to tell the referee, almost wordlessly: “Me? How come me? I never touched him at all!” Hands raised in amazement… eyebrows raised… – all of these are more efficient than an interpreter standing in the middle of the field and explaining to the referee the claims of the frustrated player. The late Arik Einstein* (one of Israel’s most popular music icons) wrote a song during the 1990 World Cup composed entirely of the names of the players participating in that tournament. Arik Einstein, who was a sort of genius in mimicking accents, expressed all the names at an incredible speed while accurately pronouncing each name. But what do those who are not Arik Einstein do, for instance a sports commentator broadcasting a game who encounters names somewhat more complicated than Leo Messi, and there are plenty of those? In the few games that I did watch, I had the pleasure of hearing broadcasters and commentators struggling hard with names of players from the Ivory Coast and from Portugal, which they didn’t have the faintest idea how to pronounce. As someone who has been dealing with translation for many years, I am familiar with the problem. In our profession there are numerous names, especially professional terms with which the translator must cope in real time and do serious homework in order not to cause us embarrassment. Although we ensure that all our translators are native speakers, but still, not all of them have studied nano technological engineering and thus have to make an effort to understand the material before beginning to work. To assist the frustrated sports broadcasters, a brilliant solution was found in the form of a new Internet site known as www.namez.com where all the names of the World Cup players can be found spoken in the local accent by a native speaker. So let’s see you trying to learn how to pronounce the name of that amiable guy from Cameroun: Cedric Djeugoue. Something else I noticed during the World Cup was that almost every team has a nickname. This surprised me since, to the best of my knowledge, the Israeli national team is known simply as – the Israeli national team… but at the World Cup every team boasts a catchy nickname that is a source of pride for its players and supporters. And so, since most of the nicknames appear in their original languages, I researched and translated the nicknames of the teams. … So excuse me while I’ll join the two Fiery Ones living at home with me. Move over, guys, I’m starting to get hooked! would love you to share your world cup experiences with me. * Arik Einstein is widely regarded as one of Israel’s most popular music icons. His music career began in the late 1950s when he was drafted into the IDF and joined one of the musical troupes. After his military service Arik continued his amazing musical career, spanning six decades as a soloist and in various groups with many other leading musicians. From the 1980s, Einstein who was already regarded as an elder statesman of popular music in Israel, decide to refrain from public performances and concentrated on studio recordings. An avid sports fan, Arik in his youth was a junior high jump champion. In November 2013 a fatal aortic aneurism stilled the beloved voice of Israeli music at the age of 74. How to order 3 glasses of whisky in German Ladies and Gentlemen – Extreme Makeover – The Corporate Edition!